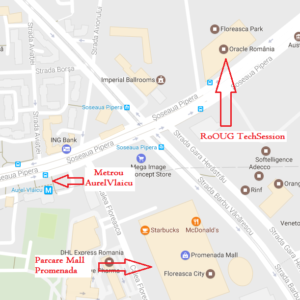 On 14 November 2017, Romanian Oracle User Group prepared a new event dedicated to Oracle passionate professionals. This seminar will cover a full day schedule and will present Edition Based Redefintion (EBR) – Oracle Database feature that permit upgrading applications with zero down-time. Shot description: In general, patching or upgrading the artifacts in an Oracle Database that implement an application’s back end involves changing two or more functionally dependent objects. Because each DDL autocommits, such changes inevitably imply that the system is mutually inconsistent once the patching begins and that its integrity is regained only when patching completes. Before EBR, your only option, therefore, was to take downtime. EBR allows you to create a semantic copy of the live system within the same database so that you can make your changes to that while the live system remaims in interruped use. Of course, the quota-consuming data nust be mutually synchronized, transactionally. EBR supports this too. This workshop explains how it all works. Bryn is a “leading expert” in EBR. He was part of the team that did the requirements analysis (Oracle E-Business Suite was the commissioning customer). Then he was part of the team that did the conceptual design. He has been the Product Manager for EBR since before the GA of Oracle Database version 11.2 was announced at OpenWorld 2009. (This is the version that brought EBR.) And he continues to participate in conceptual design work with each new database release. He has presented on EBR an uncountable number of times, both at conferences and in bespoke web conf presentations for customers. And he has advised many customers about their adoption and deployment of EBR. Bryn is an Oak Table member. The workshop is organized with logistic help of Oracle Romania and will take place at Oracle’s location, Floreasca Park, Ground Floor hall GF03. This is an event that requiers previous registration and payment of a 20 Lei ticket. RoOUG Memebers have 10 lei discount.